I hope you had a great Thanksgiving! Now that the big meal is behind us, we can officially start making Christmas cookies! I look forward to this moment all year long because the ritual of making cookies - filling the house with the aromas of sugar, butter, spice, and, of course, chocolate - and sharing these special morsels with loved ones, or to gift to others, is a big part of the holidays for me. I'm so excited to be in my little kitchen baking cookies for the holidays. Last year this time, we were living in a bit of a construction zone as we renovated our kitchen. Because of that, there was very little in the way of homemade cookies, or any cooking or baking in general, and I missed it dearly. It aways seems like there's so little time to make, eat, and share cookies during the holiday season so let's start early and savor it the best we can. My agenda's pretty full with a few family favorites that I have to make but I also like to fit in a few new (to me) recipes. So I started by making these chocolate peppermint cookies, which are delightfully soft and chewy on the inside while a coating of granulated sugar on them a light crunch on the outside. 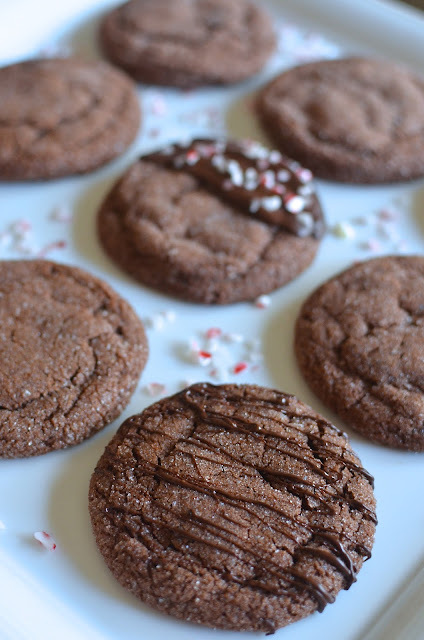 These cookies are based on The Sweet and Simple Kitchen's chocolate espresso sugar cookie recipe. I love the texture combination of a chewy interior and crackly exterior but as good as espresso sounds, I wanted to go for with peppermint flavor for the holidays (very much like these cookies). I went fairly easy on the peppermint so that in the end, you have a soft and chewy chocolate sugar cookie with a cooling peppermint effect in your mouth. Come holiday time, you can't resist bringing out the stencils, sprinkles, candies - all the things that help embellish and make your cookies a little extra special. It's a special time of year and it's nice when our food reflects that. These cookies are just fine as they are out of the oven, with their crackly, shiny tops. If you have time, adding some extra chocolate, sprinkling them with some peppermint candies or festive sprinkles, are a nice touch. 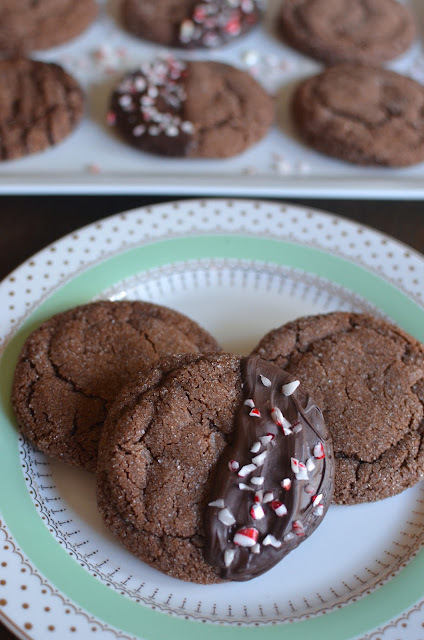 These chocolate peppermint sugar cookies were a hit at my house and a nice way to start the holiday cookie season! Truth be told, I might have actually baked these before Thanksgiving was even a wrap but I figure it's never too early to get started on enjoying Christmas cookies. And now that we've started, we're just going to keep baking, eating, and sharing. Happy Holidays! Preheat oven to 350 degrees. Line baking sheets with parchment paper or silicon baking mats. In the bowl of a stand mixer fitted with the paddle attachment, beat butter with the sugars until pale and fluffy, about 3 minutes, scraping the bowl as necessary. Add egg and peppermint extract, mixing on medium-speed until fluffy. Whisk flour, cocoa powder, baking soda, and salt together in a bowl. Add the dry ingredients to the butter mixture and mix on low-speed until just combined. Scoop dough into about 1 1/2 tablespoon mounds. Then roll the dough into balls using your hands and roll the balls in an extra bowl of granulated sugar. Place dough balls onto the prepared baking sheets, spacing them about 2 inches apart. Bake for 11-12 minutes, or until the cookies puff up and begin to crack on the surface. Remove from the oven, let cookies rest on the baking sheet for a few minutes before removing them to a wire rack. Crisp edges and chewy soft center...these cookies are simply perfect and very festive too. I really liked the texture, too. Happy holidays! Chewy interior and crackly texture... I'm in for these cookies! Yum! It's probably my first choice when it comes to cookie texture. Hope you had a great Thanksgiving! Lets hear it for the holiday baking season!!! yes time always seems to fly this time of year at record speed. Love everthing about these cookies Monica, chewy and chocolate with a little peppermint, perfection I say! I know you've got plenty of holiday spirit, Cheri. Thanks and have a great holiday season!